What are digital radio ensembles? What are digital radio ensembles? A digital radio ensemble is a collection of radio stations. Most of the time you don’t need to be aware of these ensembles or know which ones you receive. When you perform a scan on your digital radio it will check all of the frequencies and store any stations which it finds, placing them in an alphabetical list. Digital radios in cars often make the use of ensembles more apparent than the radios we use at home. If you can only select a station from a small number it could be that your radio is only offering the stations which are available on the current ensemble. As car DAB radios don’t perform an auto-scan and put every station in an alphabetical list you sometimes have to browse stations by ensemble. The exact approach varies from one manufacturer to another. Some car radios use left and right arrow buttons to choose the station. This action might just be browsing within that ensemble, and to find other stations you might need to hold the arrow button down to make the radio search for the next ensemble. On other car radios reaching the end of a list of stations available in one ensemble will make it look for the next. It is worth checking your car radio manual to find out how your particular receiver deals with them. Why are there DAB ensembles? When we tune into analogue radio stations we’re often aware of the frequency – like 95.4 FM for BBC Newcastle or 100 FM for KISS in London. This contrasts with digital radio where several radio stations are broadcast on a single frequency. The ‘multiplexing’ of individual services into a single ensemble is what makes the extra choice afforded by digital radio, Freeview, Sky and other systems possible. Each of these frequencies is assigned a block name that you might see with the ensemble name. For example, block 12B is used for the BBC National DAB ensemble with the frequency of 225.648MHz. Thankfully we don’t need to remember that to listen to BBC Radio 2! In the UK there are three national ensembles. The BBC operates one for its national services like Radio 2 and Radio 4 Extra. The other two national ensembles contain commercial radio stations, such as Absolute Radio, talkSPORT, LBC and Radio X. Then there are smaller ensembles covering local areas like London, Tyne & Wear and Northern Ireland. Unfortunately the way ensembles are presented on car radios is not terribly user friendly. It shouldn’t be necessary to browse stations by ’11B’, ‘SDL National’ or ‘Teesside’ to find a particular station. 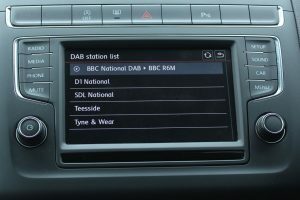 The radio and car industries are aware of the issues facing motorists with digital radio and are looking at how interfaces can be improved.